In the context of growing concerns over gender disparities and the resulting adverse impacts on society and economy, the issue of the contribution of women in the national economy has emerged at the centre stage of development discourse in most countries. However, traditional gender norms and patriarchy often restrict women's mobility and constrains their activities in the labour market. This scenario is particularly common in the South Asian context, resulting in relatively much lower participation and concentration on low-paid activities for females in relation to their male counterparts. In Bangladesh, women's contribution to the national economy is much lower than the potential due to the low participation of women in the labour market. While recognising the significant contribution women make in non-market activities, such as household work and caring of children and elderly at home, none can deny the fact that a critical factor for ensuring inclusive growth in the economy requires a much larger participation of women in the market-based productive activities. However, it is not only on the ground of economic efficiency, but also for the sake of greater equity and inclusive growth perspective, it is crucial to have greater level of engagement of females in the mainstream economic activities. In the context of the labour market of Bangladesh, the most noticeable change has been observed on rising participation of females in the labour market, with the rate of participation rising from around 8.0 per cent in the mid-1980s to almost 36 per cent in 2016-17. Given the patriarchal and conservative social structure of the country, such trend in female labour force participation, though praiseworthy, should be analysed more critically for a number of reasons. Firstly, despite the increase, females' participation rate is still much lower than that of males, where the latter's participation rate is similar to those of advanced economies. Secondly, the participation rate of females for the last one decade or so has not increased much and is still hovering at around 36 per cent. Thirdly, when the question of quality of employment arises, women are mostly found in low paid and low productive activities, and over time there has not been much progress in their relative position in the occupational ladder. A significant percentage of women are even involved in unpaid activities in family firms. In this context, recent trend in RMG-the key sector of female wage employment in Bangladesh shows a fall in female employment too (In a 4.0 million industry, 90 per cent of the employees were females even 10 years before, where the corresponding proportion is only around 65 per cent). Finally, in recent years there are growing concerns that female workers are more vulnerable compared to their male counterparts in the era of technological advancement and increased automation. Therefore, both from numerical point of view as well as from qualitative aspect, recent labour market status of females deserves an in-depth analysis. From supply side of the labour market, probit estimates with the latest data (Quarterly Labour Force Survey 2016/17) reveal that labour force participation increases with age but at a decreasing rate whereas the role of marriage is found to be negative. The result of education coefficient has, however, come in contrast to our prior expectation. The education paradox is indicating the possibility that in recent years the role of education in boosting females' participation in the labour market has weakened, at least to a certain extent. [Probit estimates of sectoral disaggregation (non agriculture vs. agriculture), however, highlights the contrasting role of education as education is found to be playing a strong positive role in the choice of non agricultural activities]. Table 1 also shows that household income has a negative role for participation, so has household landholding. Both the coefficients reflect the possibility that labour force participation of women in Bangladesh is primarily driven by 'push' factors, and therefore, females from relatively poorer households with lesser landholding have greater probability to participate in the labour market. It is interesting to find that although the occupation of household-head (being self-employed or not as well as being in agriculture or not) has positive role on its member's involvement in the labour market, their education has the opposite effect. The latter coefficients are likely to be the reflection of own education coefficients and similar explanation may hold, where the former coefficients might be the result of high prevalence of family labourers in Bangladesh. The most interesting finding of the profit estimates is probably the strong negative impact of the presence of young children on participation probability. Patriarchal gender norms assigning the domestic responsibilities to women, accompanied with the absence of proper 'care system', often restrict women to engage in the labour market. There is no denying the fact that given the patriarchal social structure of Bangladesh, females are often discriminated against their male counterparts in different sectors of the economy and society, including that of the labour market. One way to capture such discrimination is to decompose the difference in market outcomes (e.g. labour market participation rate) of men and women into two parts: (i) difference in outcome that could be the result of differences in characteristics or endowments (age, education, regional factors etc.) and (ii) difference in outcome that is generated due to the differences in coefficients of regression (returns to coefficients). [ In literature the most commonly used decomposition analysis is that of Blinder-Oaxaca Decomposition.] The decomposition analysis of the results of Table 1 is presented in Table 2 and shows the dominance of the effect of unexplained part (generated from coefficients) than that of the explained part (resulting from 'inferior' endowments). While analysing labour market experience, we should keep in mind that, it is not only mere participation in the labour market but also the mode of participation that should be analysed. 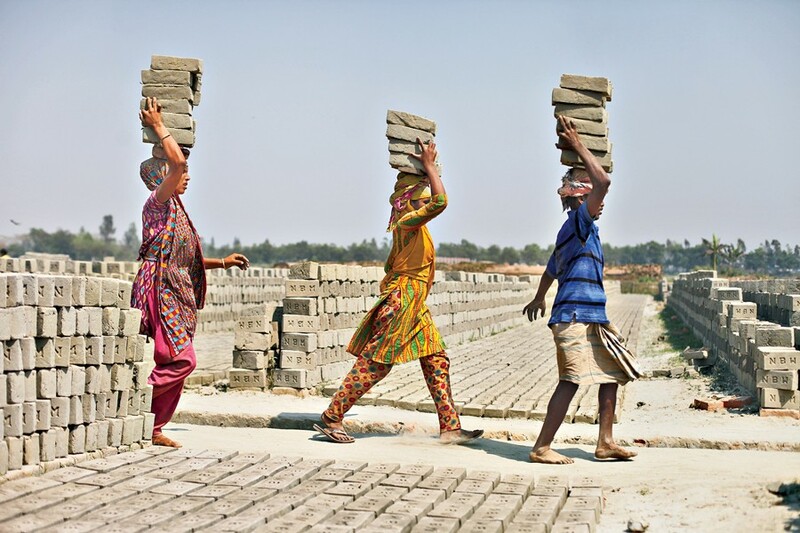 This is specially important for countries like Bangladesh where a significant percentage of labour force are engaged in family firms-around 29 per cent of employed female work force are found to be unpaid family worker. A Multinomial Logit estimation of different modes of labour market participation (wage employment, self employment, unemployment and unpaid work, where the latter is the base), in this context reflects differential effect of individual, household and gender norm centric factors on choice of occupation (Table 3). *Given the importance of gender norm centric domestic/care responsibilities of women, an important policy intervention from the government could be that of providing support through tax rebate, cheap credit facility etc. in establishing day care centres at workplace. In addition, strategies like those of extending the provision of maternity and post-maternity leave and introducing flexible and part time working hour and distant working scheme can turn out to be useful in this regard. In case of maternity leave, enforcing the leave in the private sector should be key focus area for the government. * There is no denying the fact that early marriage and early pregnancy act as critical deterrents of females' labour market participation. The importance of stricter and careful implementation of anti-child marriage laws cannot be over emphasised. * Ensuring gender-friendly environment in educational institutes (e.g. separate bus service, toilet facilities, etc.) as well as in training centres (and work places) can proved to be instrumental for greater involvement of young women and girls at the secondary and tertiary level of education. Monetary incentives from the government, and public-private partnership can be useful strategies in this respect. * Low level of skill along with the mismatch of skill offered by the traditional education system is acting as one of the prime reasons for females' inferior position in the labour market. In order to deal with such issues, it is critical to align the curriculum with the 'actual' market demand. A number of policies like strengthening the collaboration between vocational institutes and industry; involving industry sector representatives in designing curriculum; linking secondary education along with the TVE programmes to the existing demand can prove to be useful. * Given the dominance of unpaid work among females, it is important to consider strategies to bring them into main-stream labour market activities. There should be increasing initiatives from the government as well as the NGOs including those of establishing information cell in upazilas, providing credit at low interest rate with flexibility in terms of collateral etc.